Customers who are in search for a router that is too fast for its own good should take under consideration the new TP-Link Talon AD7200. This new router comes with super powers. 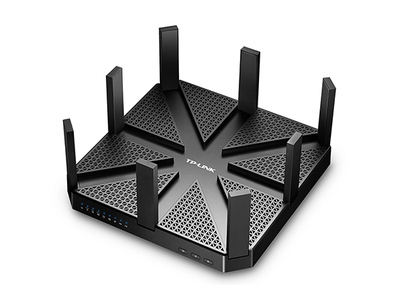 The new TP-Link Talon AD7200 is unlike any other router. This device is the first 802.11ad router that has the power to deliver up to 4.6Gbps Wi-Fi speed on the 60GHz band. But, at the same time it will also serve data on the more traditional 5GHz and 2.4Ghz bands. So, this means that there are three different bands, all operating at once. Without a doubt, this is a first for a Wi-Fi router. Probably, customers are not aware of these new features that the new TP-Link Talon AD7200 has the power to deliver. We are thrilled to find out that a Wi-Fi router manufacturer has decided to come with something new packed into its devices. So, what is 802.11ad? Well, it is a new Wi-Fi standard that operates on the 60GHz frequency band and has amazing high ceiling speed, up to 7Gbps. This is something more powerful compared with the 1.3Gbps that most users experience nowadays. Moreover, these traditional routers also come with extremely short range, approximately 30 feet at most and don’t have the power to penetrate walls, which means that these devices will only work if they are within the line of sight of the router. The new 802.11ad is meant to supplement the existing 802.11ac, which has a much longer range. This means that all 802.11ad routers will have access to the amazing 60GHz band, but also work as traditional 802.11ac routers. To be added that 802.11ac is the standard most routers on the market use today. What do customers need to take full advantage of the new 802.11ad? Well, for starters we need to say that the new TP-Link Talon AD7200 doesn’t support full speed of 802.11ad, but just at 4.6Gbps, which is also very fast. So, to take full advantage of 802.11ad, customers will need at least two clients, for example a laptop and a smartphone that support 802.11ad. Unfortunately, we must say that there are just a few of these type of smartphones, tablets or laptops, currently on the market. But, those who are owning an Acer TravelMate P446 should know that they will have access to 802.11ad. So, they just need a network cable to connect the router to a file server and then copy the file to the Acer via Wi-Fi. Probably, many people will ask that since there are so few 802.11ad clients on the market, why should we care about the new TP-Link Talon AD7200? Well, because faster is always better and this new router gives us this opportunity. When there will be more 802.11ad devices on the market, the new TP-Link Talon AD7200 will give us the option of wirelessly connecting them together at amazingly fast speeds. It will be a pleasure to know that we could be able to quickly connect the laptop to a big-screen TV and instantly stream 4K video on it.